We continue to rely on our innovative technology and introduce WELBACH - our brand of digital welding machines. The units use the fully digitally operated Stamos machine interface. High quality control panels ensure maximum comfort. The digital signal processors monitor all parameters so that the operations performed always exactly match the values set. The Welbach range plasma cutters are also equipped with original TRAFIMET® plasma torches. The automatic Pokerface welding helmet from the Professional Series from Stamos Germany is characterized by its light weight and good response speed. The welding helmet is extremely versatile and can be used within all common welding processes (MIG welding, MAG / CO2 welding, manual welding, TIG welding, plasma cutting and micro plasma cutting). In addition, the automatic welding helmet Pokerface is known for its long-lasting visibility (cartridges). The cartridges are powered by solar cells and a CR2450 battery. The welding helmet works with a particularly wide range of light protection, which can be flexibly adjusted from DIN 4 - 8 or from DIN 9 - 13. The size of the screen is an extraordinary 100 x 65 mm. In this way, you can always keep an overview of all the essential details. The welding helmet is made of robust plastic. This ensures that the welding mask weighs only about 500 grams and that you do not have to worry about any restrictions or pain during work. A particularly prominent characteristic of the Pokerface is the simple adaptation to every head shape. Also adjustable is the distance between the face and the visor. This guarantees that the helmet sits extremely securely and can be used first-class. In addition, Professional Series welding helmets have an outstanding response time of 1 / 30,000 seconds from light to dark. This means that you are always protected from dangerous arcs. The outstanding reaction time also allows for a seamless transition without the eyes being too stressed or requiring a prolonged adaptation time. 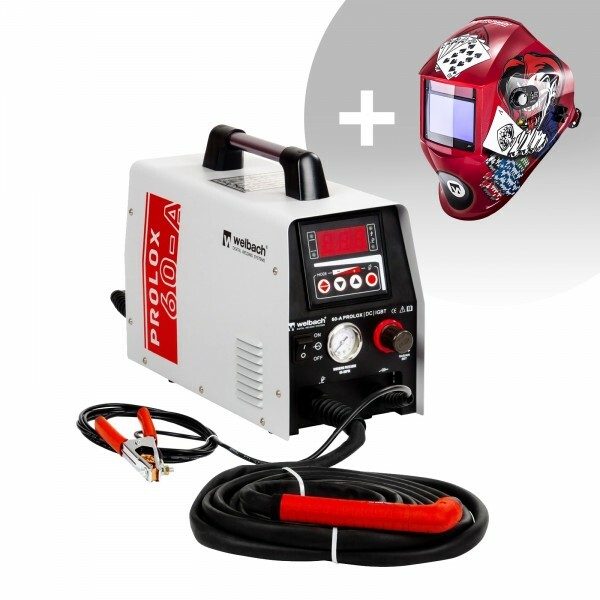 The automatic welding helmet Pokerface can be used with all common welding procedures and also has a practical grind mode. Thus, the helmet can be used for pure roughing, cutting and grinding work without an annoying up-and-down. Pokerface stands out as early as 3 amps. Whether you are an artisan, or want to use the welding helmet for private use or to be used in the workshop, the Pokerface combines all the necessary protection mechanisms and impresses with its quality and longevity. IGBT = insulated-gate bipolar transistor. IGBT is a bipolar transistor with an insulated gate electrode. This semi-conducting device is being increasingly used in power electronics because it combines the advantages of two transistor types: the easy controls of the field effect transistor and the fast switching and high breakdown voltage of the bipolar transistor. The IGBT also offers some robustness against short circuits because it limits the electrical continuity. IGBTs are a further development of MOSFET technology. Powerful fans ensure an optimal removal of heat from the unit. For plasma cutting, a gas is required with which the molten metal is blown away from the work surface. Compressed air is a common solution for this. For this purpose, the plasma cutter has a compressor connection. On the back of every welding machine is a screw with an earthing mark. Before use, earth the unit via a cross-section cable, which must be at least 6 mm². This device works with a 1-phase connection (230 V +/- 10 %). Start the weld by placing pressure on the torch button. Stop the process by releasing the button. By pressing the torch button the solenoid valve opens. allowing the gas to flow in. The gas pre-flow ignites the arc at the pre-set current. Releasing the burner button initiates a rise in the current to that of the pre-set welding current. The welding process stops once you press the burner button again. The plasma arc melts the metal and the kinetic energy of the compressed air blows the metal aside. Choose between the 2T and 4T mode. The LED light indicates overheating or a malfunction. Shows the value of compressed air the compressor delivers to the plasma cutter. The plasma cutter has a pressure reducing valve which regulates the air pressure.